A cut garden is something that will bring joy to both those who plant it and those who admire it. As we continue to expand on our offerings, we encourage you to explore the world of bulbs. Decorating your home with flowers like Tulips, Daffodils and Narcissus is a great way to add color and life to your surroundings. Planting bulbs is very easy to do and an extremely rewarding investment. We now have an assortment of bulbs for sale including Tulips, Narcissus, Allium, Anemone and more. We have carefully selected each bulb in order to bring you a variety of our favorites. You will surely enjoy the many colors and types we have in stock. The best time to plant bulbs is anytime between now and the end of November. These little wonders are ideal for making colorful borders, filling garden beds, or packing in random places throughout your yard. Come in today and browse our selection. Our experts are happy to show you what we have available and make recommendations. Put your hard work and care into your landscape today and reap the benefits in spring. Time to get to work! We are pleased to announce that we are extending our nursery offering to include flowers for cutting. For most gardeners, assembling a bouquet of flowers is a great pleasure. Selecting blooms from your very own garden allows you to appreciate plants in a new way, while creating a beautiful and unique bouquet. Beginning this Thursday, we will offer a beautiful assortment of dahlias in various forms and colors grown in 2-gallon containers for $19.95 and $24.95. Aztec Dahlias has been the perfect partner to work with to begin our expansion. Owners Kate and Omar grow the most beautiful dahlias you have ever seen. Just like us, they take pride in providing our community with a product that is unmatched in both quality and variety. Their cut flowers and plants are sold locally to florists, shops, restaurants, individuals on site everyday and at select farmers markets. They have a great selection of tubers available online as well. It's a joy to pick a little of whatever is blooming in your garden and bring it into your home or to share with family and friends. We’re extremely excited to work with Aztec Dahlias to expand on your love of gardening and bring you something we’re sure you’ll enjoy. 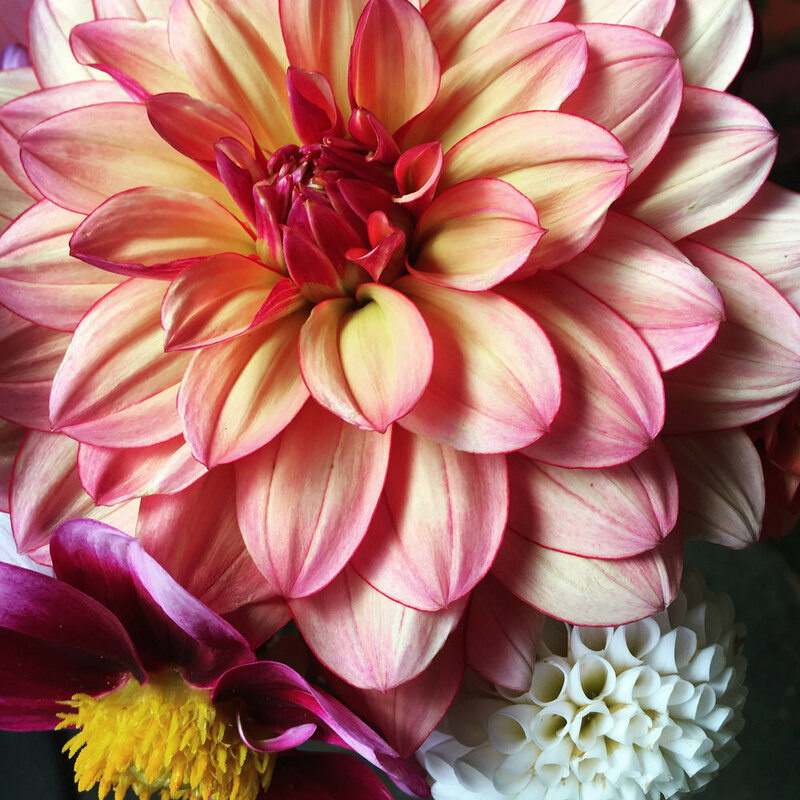 Dahlias make great cut flowers, are a gorgeous addition to any garden and are sure to brighten your day. Come in and select your favorites today. Everything is better with garlic, including your garden. We now have a diverse assortment of over 40 varieties of garlic for sale. If you've ever thought about planting garlic, fall is traditionally the best time to do so. In Northern California, you should plant garlic by the end of the first week of November. After planting, you will notice growth in approximately two to three weeks as your garlic begins sending up tiny green shoots through your soil. Around June, your garlic will begin forming what's known as garlic scapes. Cut off the scapes so the plant can focus its energy on developing the head of the garlic. Garlic scapes are a delicious addition in many meals. Stop watering your garlic in June and let them rest until harvest in July. Not only does garlic have amazing flavor, studies have shown that there are many medicinal benefits to it as well. It's great for your metabolism, has anti-cancer properties, boosts the immune system, fights high blood pressure, is rich in antioxidants, is a proven detoxifying food and is good for cognitive brain functions and memory. The list goes on. Garlic is incredibly useful in the kitchen and surprisingly easy to grow in the garden. Aside from weeding and mulching, garlic is a low maintenance crop. If you've never planted a winter garden and have a bed that usually sits empty all winter, then garlic may be the perfect option for you. Come by today and find the variety that best fits your taste. Available Garlic Varieties Ajo Rojo, Armenian, Bogatyr, Brown Saxon, Brown Tempest, California Early, California Late, Carpathian, Chesnok Red, China Stripe, Chinese Puprle, Duganski, Early Red Italian, Ferganskij, Geogian Crystal, Geogian Fire, German White, German Red, Germinador, Idaho Silver, Inchelium Red, Killarney Red, Labea, Metechi, Mild French, Montana Zemo, Music, Native Creole, Persian Star, Polish Hardneck, Purple Glazer, Red Grain, Romanian Red, Rose De Lautec, Russian Red, Shatili Siberian, Sicilian Silver, Silver Rose, Spanish Benitee, Spanish Roja, Uzbek, Vekak.